When first approached to be part of this show I wasn’t quite sure what to expect. I was delighted to be asked, but felt foolish for not taking the opportunity to read the poetry of James Hearst in the several years that I had worked for the Hearst Center. Once I began sifting through James Hearst’s work I decided to rely on the poems that conjured up very potent visual images. There were several selections from the collection that really stuck with me; A Curious Critter, The Captain Ashore, The Great Coincidence, and Frustration are a few that come to mind. For this project Hog Economy become my inspiration. There are three very distinct yet very closely related visual images or interpretations that branched off of this one poem as I read it. I combined the different characteristics into a fluid idea for the final sculpture. I first thought about Hog Economy literally as hogs on the farm fighting for space at the feeding trough. The smaller hog didn’t have a chance it couldn’t compete because of its size. 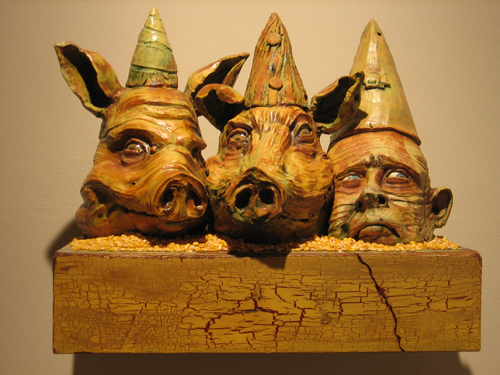 I secondly thought of Hog Economy as a political statement. The poem seemed to parallel modern styles of consumerism and the idea of big business. Lastly I thought about the poem as an allegory for life. Growing up, trying to fit in, and ultimately finding your place in the world.